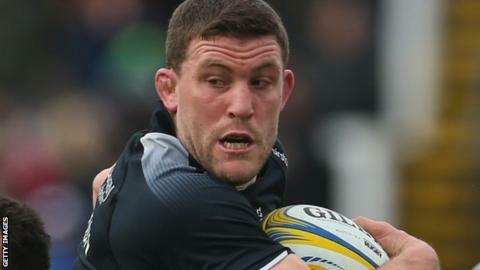 Newcastle Falcons are relishing the importance of Sunday's bottom-two Premiership showdown with London Irish, says back row Mark Wilson. Irish, currently bottom of the table, trail the Falcons by four points. With four points for a win, plus potential bonus points for tries and losing margins, the Falcons could form a points buffer with two games to play. "We want to play in these games because it's exciting and it brings out the best in people," Wilson told BBC Sport. "We're professional rugby players and we get paid to perform in these high pressure environments. Nobody wants to play in dead rubbers, just turning up and playing." Newcastle are expecting a large crowd at Kingston Park, with 5,000 tickets sold by the beginning of the week. The importance of retaining top-flight rugby in the north east is not lost on the squad, who have had almost two weeks to contemplate the match during the European break. "It's been bigged up to be a big game and rightly so," Wilson added. "With the gap at the bottom it is a big game and no getting away, but these are the games we want to play in." While the precarious position of both sides has helped sell tickets, the Falcons can feel disappointed to still be in the battle against drop after their mid-season revival. Six straight home wins after the turn of the year, four of them in the league, lifted Dean Richards' side up the table. But narrow defeats since then by Worcester, Bath and Wasps have placed jeopardy on their place in the elite. "There's a sense of frustration that we're in the position we are," Wilson added. "I think if you look back six or seven weeks, we were on the back of six wins on the bounce at home where we beat Bath, Quins, Leicester and Northampton - we didn't think we'd be in this situation. "It shows how competitive the Premiership is, and you can't take any team lightly but we know we can compete with the best teams. "It's a case of knowing we've got to perform. It's not rocket science, just doing the simple things really."